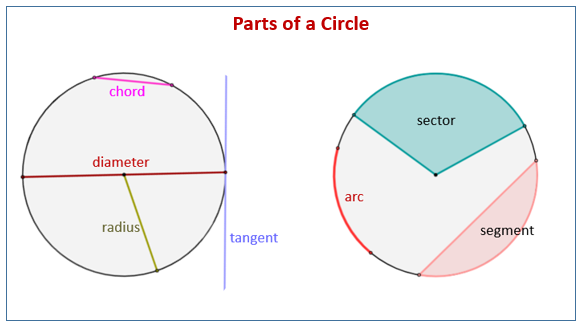 The following figures show the different parts of a circle: tangent, chord, radius, diameter, arc, segment, sector. Scroll down the page for more examples and explanations. In geometry, a circle is a closed curve formed by a set of points on a plane that are the same distance from its center O. That distance is known as the radius of the circle. The diameter of a circle is a line segment that passes through the center of the circle and has its endpoints on the circle. All the diameters of the same circle have the same length. A chord is a line segment with both endpoints on the circle. The diameter is a special chord that passes through the center of the circle. The diameter would be the longest chord in the circle. The radius of the circle is a line segment from the center of the circle to a point on the circle. In the above diagram, O is the center of the circle and and are radii of the circle. The radii of a circle are all the same length. The radius is half the length of the diameter. An arc is a part of a circle. In the diagram above, the part of the circle from B to C forms an arc. It is called arc BC. An arc can be measured in degrees. In the circle above, the measure of arc BC is equal to its central angle BOC, which is 45°. A semicircle is an arc that is half a circle. A minor arc is an arc that is smaller than a semicircle. A major arc is an arc that is larger than a semicircle. How to identify semicircle, minor arc and major arc? A tangent to a circle is a line that touches a circle at only one point. A tangent is perpendicular to the radius at the point of contact. In the above diagram, the line containing the points B and C is a tangent to the circle. A secant is a straight line that cuts the circle at two points. A chord is the portion of a secant that lies in the circle. where C is the circumference, d is the diameter and r is the radius. Worksheet to calculate the circumference of a circle. Worksheet to calculate the area and circumference of a circle. Example 1: Find the circumference of the circle with a diameter of 8 inches. Answer: The circumference of the circle is 8π ≈ 25.163 inches. Example 2: Find the circumference of the circle with a radius of 5 inches. Answer: The circumference of the circle is 10 π ≈ 31.42 inches. where A is the area and r is the radius. Since the formula is only given in terms of radius, remember to change from diameter to radius if necessary. Worksheet to calculate the area of a circle. Worksheet to calculate problems that involve the radius, diameter, circumference and area of circle. Example 1: Find the area the circle with a diameter of 10 inches. Answer: The area of the circle is 25π ≈ 78.55 square inches. Example 2: Find the area the circle with a radius of 10 inches. Answer: The area of the circle is 100π ≈ 314.2 square inches. How to relate the radius and diameter of a circle with its area? It explains how to find the area of a sector.